Well, not quite as complete as I’d have liked but perhaps we were asking a little too much of ourselves! There are a few things we didn’t manage to do at all, crazy gold, ike skating and visiting the Science Museum are a few! Some are half done, like getting a new roof and finishing the kitchen; we will be getting the roof after the winter and the kitchen just needs a small area of work top replacing and for me to paint the cupboard doors! I’m not entirely sure if we managed to cook a new meal a month, probably a few months but my plans to record them didn’t happen! We both went sugar free for a month, Sam still is mostly sugar free in fact, as he’s still on a Ketogenic diet. I tried it for a while, but found it affected my eyes – something to do with the fat levels I think! Sam has lost over 1.5 stone and gone down 2 full shirt/waist sizes which is impressive… I lost a stone then it all went right back on again in the run up to Christmas! I am hoping to join Sam’s gym when Arlo gets his 30 hours free childcare in the spring and I’ll have a bit more money to play with! We’d both like to go swimming more with the kids and teach them to swim next year, though sam will need new swimming trunks as his old ones are way too baggy! I read over 40 books this year, so ticked that one off (44 and counting in fact, you can see them here on goodreads) and I was quite impressed with myself, as there were a good few chunks of the year when I didn’t read at all, but others when I read like a demon! There is definitely not a nicely decorated living room, nor is there a ‘place for everything in the house’ – seriously who was I kidding with sticking that one in there? It was never going to happen! 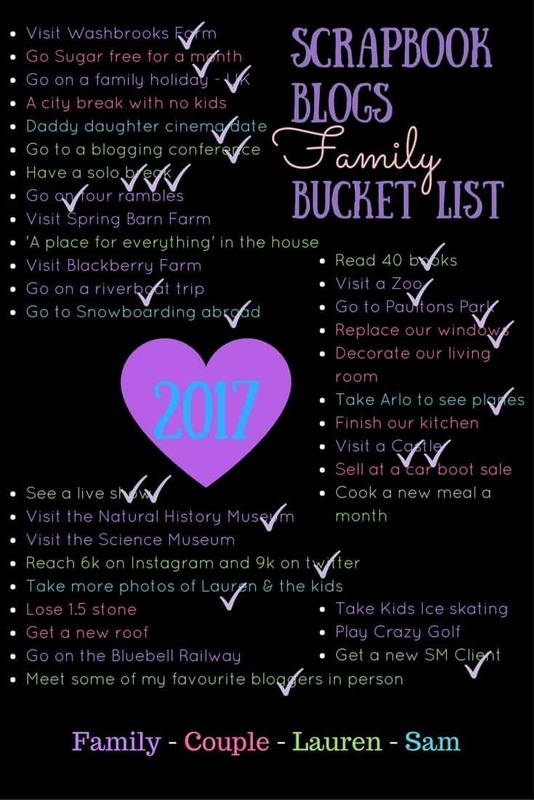 I’m not sure what will make it on to our bucket list for next year just yet, I’ll keep you posted! It always shocks me how many people don’t know the meaning of the term ‘bucket list’!! So were you planning on dying before the year is out because I don’t see that on your list? A bucket list is ‘things to do before you die’!! Haha no… I do know the proper meaning but a ‘list of things we really want to do before the year ends’ doesn’t have the same ring to it!